NASHVILLE, Tenn. (AP) — Most folks know Memphis for its barbecue and Philly for its cheesesteaks, but how about Nashville and its hot chicken? If you're not sure, you've never tried this fried chicken so fiery it will leave your mouth in shock. It's a flavor you don't soon forget. Born as cheap, flavorful fare for Nashville's working class community and offered late into the night for its party-goers, hot chicken has long been a staple in town. But its reputation has grown in recent years. Taylor Swift and B.o.B. even featured one of the city's best known hot chicken shops in a video they did together. At heart, it's fried chicken that gets finished with a potent — and nearly always secret — blend of dry, peppery seasonings (paprika and cayenne are common, though that's just the start). But that oversimplifies things. "I don't know," James McNew, hot chicken fan and bassist for New Jersey indie rock band Yo La Tengo, says of the recipe. "Some kind of combination of love and hate. I'm not sure of the measurements, whether it's half and half or not." McNew and husband-wife bandmates Ira Kaplan and Georgia Hubley have been coming to Nashville for almost two decades. For the music, of course. And the chicken. They sing its praises to anyone who will listen. They even named two songs in honor of their love for Prince's Hot Chicken Shack, which has been serving up searing hot chicken since sometime during the 1940s. "It's something different," said Andre Prince Jeffries, second-generation owner of Prince's. "It's not a boring chicken. I mean, you wake up on this chicken. You're gonna talk about it." And talk about it they do. The members of Yo La Tengo heard about hot chicken from another band that already had fallen for it. They visited the humble strip-mall home of Prince's in north Nashville, far from the trendy districts, and were immediately enchanted. "It really was love at first sight," Kaplan said during a recent interview at Prince's. "Even before we tasted it. It was obviously unique." 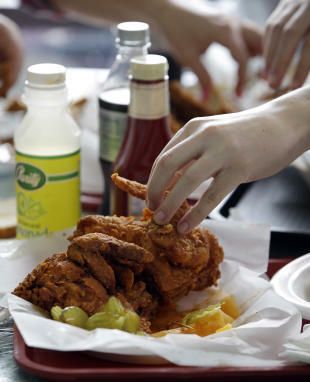 Prince's is the most popular of Nashville's growing roster of hot chicken restaurants. Over the years, it has moved several times and its owners have missed a few bills, but Jeffries, with the help of her daughter, niece, brother and cousins, has managed to keep it in her family. As the story goes, it all began with Jeffries' great uncle Thornton Prince, a bit of a man about town whose girlfriend had put up with enough and wanted a bit of spicy retribution. So she made him a special chicken for breakfast with a fiery kick. "But he liked it, I'm sure after he kind of startled himself on it,'" Jeffries said. "He had her make some more, whatever stuff she put on it. And word got around. People started coming out to the house for chicken." "My great uncle started it, but of course I give credit to his lady friend," Jeffries said. Sixty-odd years later, the family will be honored in May with a prestigious James Beard Foundation America's Classics Award. It's a proud moment for Jeffries, but one born out of a simple idea. "I just wanted something to stay in the family," she said. "Mom and pop places, they are phasing out. Big business is taking over, and so I think there's very few mom and pop places open that's been going for as long as we have. That was my goal. But it's nothing that I've done. I'm standing on the shoulders of somebody else." Many of Nashville's hot chicken restaurants are family run. Like Prince's, the chicken recipe at Bolton's Spicy Chicken & Fish — the restaurant that made the appearance in the B.o.B.-Swift video for "Both of Us" — has been handed down from one generation to the next. Dollye Ingram-Matthews, who owns Bolton's with her husband, Bolton Matthews, thinks there's a reason it's become a Nashville tradition. "Probably because it's nowhere else and you have to have experience with it to know what you're doing," she said. "It's not something you can say, 'I'm going to open up a restaurant and da da da da da.' You have to have experience with the pepper to make sure it comes out. Because if not you're going to have a lot of errors with your cooking." The same is true for the customer. Ordering errors occur all the time. It's best to start low. Hot is over the limit for most people, Ingram-Matthews says. And mild is hotter than what most chain restaurants consider spicy. Anyone who orders extra hot is asked if they're a first-timer and politely instructed to start at a lower temperature if so. And, of course, there's a little danger involved if you don't take the encounter with the fiery pepper seriously. "With the dry rub, wash your fingers," she said. "Wash up under your nail beds. Do not touch your eyes. And definitely wash your hands before you use the bathroom." Ingram-Matthews has plenty of advice. But don't bother asking her for the family recipe. "They say, 'What is the secret to your recipe,' and I say, 'Love, joy, peace and happiness,'" she said. "And I leave it that. Because it's full of all of that." To ensure that the exterior doesn't burn before the interior cooks through, keep the oil temperature between 300 and 325 degrees. In a large bowl, whisk the cold water, hot sauce, 1/2 cup salt and 1/2 cup sugar until the salt and sugar dissolve. Add the chicken and refrigerate, covered, for 30 minutes or up to 1 hour. When ready to cook, in a small saucepan over medium, heat 3 tablespoons of the oil until shimmering. Add the cayenne, 1/2 teaspoon salt, paprika, remaining 1/2 teaspoon sugar and the garlic powder. Cook until fragrant, about 30 seconds. Transfer to small bowl and set aside. Remove the chicken from refrigerator and pour off brine. In a large bowl, combine the flour, 1/2 teaspoon salt and 1/2 teaspoon pepper. Two at a time, dredge the chicken pieces through the flour mixture. Shake excess flour from the chicken, then transfer it to wire rack. Do not discard the seasoned flour. Adjust an oven rack to the middle position and heat the oven to 200 F. Set a clean wire rack over a rimmed baking sheet. In a large Dutch oven over medium-high, heat the remaining oil to 350 degrees. Return the chicken pieces to the flour mixture and turn to coat, then shake off the excess. Add half of the chicken to the oil and fry, adjusting the burner as necessary to maintain oil temperature between 300 F and 325 F, until the skin is a deep golden brown and the white meat registers 160 F and the dark meat registers 175 F, about 25 to 30 minutes. Drain the fried chicken on the prepared wire rack and place in oven to keep warm. Return the oil to 350 F and repeat with the remaining chicken. When all of the chicken is cooked, stir the spicy oil mixture to recombine, then brush it over both sides of the chicken. Serve on bread, if using, and top with pickles, if using. Nutrition information per serving: 780 calories; 510 calories from fat (65 percent of total calories); 57 g fat (10 g saturated; 0.5 g trans fats); 140 mg cholesterol; 27 g carbohydrate; 1 g fiber; 2 g sugar; 38 g protein; 1100 mg sodium.